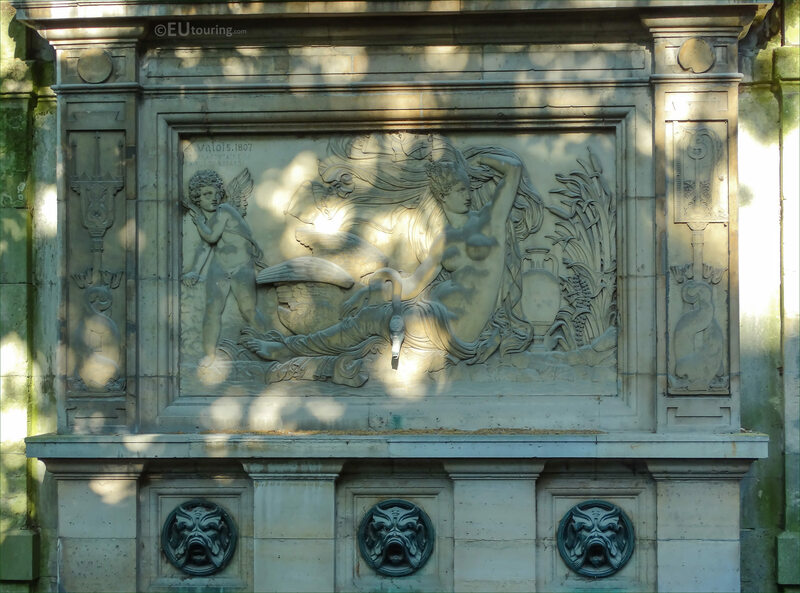 This time while we were within the Jardin du Luxembourg, located in the 6th Arrondissement, we took these high definition photos showing the Fontaine de Leda and the bas relief sculpture depicting Leda and the Swan by Achille Valois. So this first HD photo shows the whole fountain, which was named after a story in Greek mythology, and the Fontaine de Leda was one of the fountains in Paris that was commissioned by Napoleon Bonaparte at the start of the 1800s, yet was moved to its current location on the back of the Fontaine de Medici within the Luxembourg Gardens in the 1860s. Here you can see the bas relief sculpture, which depicts the story called Leda and the Swan, and in Greek mythology it was the God Zeus that turned into a swan to seduce Leda, who was the wife of the King of Sparta. Also, there is a cupid in one corner along with a vase and flowers, plus if you look carefully you can see that the beak of the swan protrudes out, and made of bronze, this was originally designed for the water to flow out like a spout, instead of the macaroons that were added later. 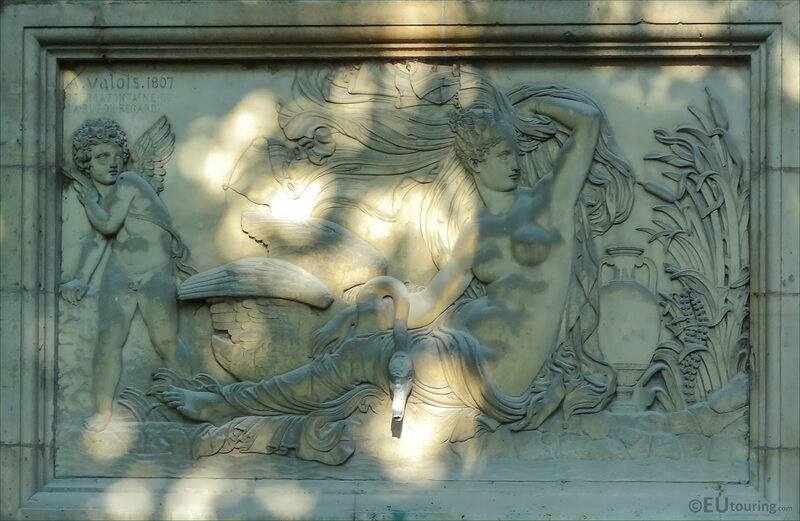 Now in this last image you can see that the sculpture has been signed by the artist Achille Joseph Étienne Valois, who was born on 13th January 1785 and became a French designer and sculptor, with one of his early projects being the Fontaine de Leda, which he produced in 1807. 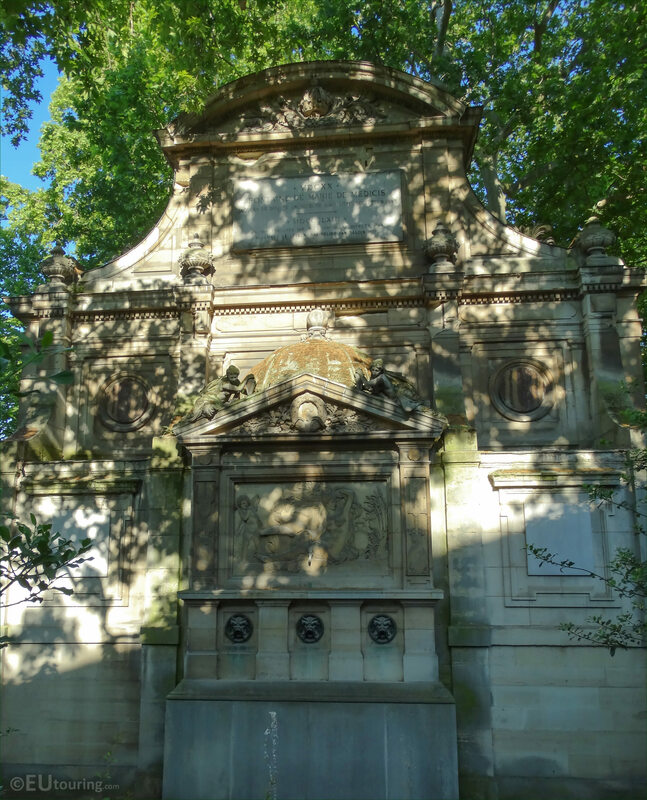 And although it is hard to see clearly, underneath his name, when translated into English its states; For the Fountain of the Rue du Regard, which is where the fountain was constructed initially, and why the Fontaine de Leda is sometimes referred to as the Fontaine du Regard. Yet this artist also worked on the shells and pearls for the fountains at the Place de la Concorde, along with many other works including several busts that can be found in museums throughout France, and Achille Valois was made a Chevalier of the Legion of Honour.